A very special Oatmeal Stout injected with our unique spiced bourbon infusion. The chocolatey, spicy aroma greets you as you start to drink. 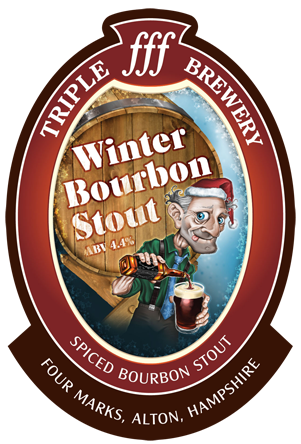 Warming and silky on the palette, rich with the spices of Christmas. Let us help you tap into your Christmas spirit! Cask at Angleterre, Helsinki. Black color. Sweet aromas of charred bread, salty licorice, roasted nuts, cinnamon and juniper. Sweet and roasty taste with licorice, cinnamon, nuts and charred bread crust. Smooth palate, light to medium body. Good fresh roasted malt character with interesting spiciness appropriately restrained. Pours almost black, with a thin brown head. Roasted, spicy aroma, coffee, vanilla, chocolate, ashes, wood. Off-dry, medium body and bitterness, low CO2. Malty, spicy taste, caramel, chocolate, coffee, vanilla, wood, ash, yeast. Well balanced, highly drinkable. Cask gravity at CAMRA Chelmsford Winter Beer Festival. Black with a good head. Thick. Chocolate, coffee, fruit and spiced (cinnamon) aroma. Very nice. Cask at the Guide Dog, Southampton. Deep chocolate brown in colour with a loose beige head; soft, chocolate malt aroma; rich in the mouth, with dry, deeply roasted malts, and some sweet boozy fruit; the finish is warming and woody, with a definite spirity edge. This is rather good.